On the right side of the row, click x. This action opens the Delete value form. 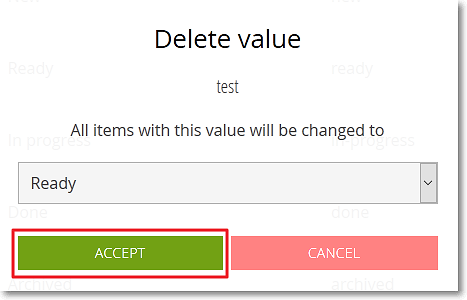 On the Delete value form, select the status that will replace the status you are about to delete – the status you select will be automatically set to any User Stories, Tasks or Issues that are currently in the status you are about to delete. Note: To close the Delete value form without deleting the status, click CANCEL.